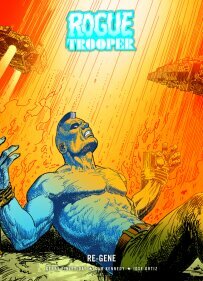 Rogue Trooper returns to Milli-Com to resurrect his dead buddies from their bio-chips. Something goes horribly wrong with the Re-Gene process and his friends literally crumble before his eyes! Now Rogue must find the antigen that will bring his comrades back for good but to do this he must travel to the planet Horst where warring aliens, hostile landscapes and deadly foes stand between him and success. 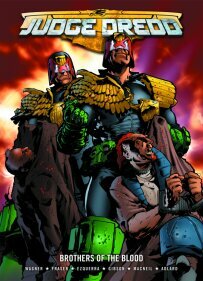 When Judge Dredd comes face-to-face with one of his clones he knows that the rookie may well be his replacement one day. Old Stoney Face isn’t getting any younger and as he shows the new recruit around the streets of Mega-City One he reminisces about his dead clone brother Rico. Out of respect for Dredd, the clone decides to take on Rico’s name but will he also share Rico’s fate?